I don't know about you, but sometimes I find the instructions on Martha's website a bit simplistic. I don't just mean that they keep it simple, but that they actually leave stuff out. Maybe it's an accident, or maybe they just don't want to explain the long, involved steps it took to get the end product. Which, if you haven't noticed, is something that just happens to be my specialty. For example, in the Stained Glass Cookie project, they say simply "Then sprinkle crushed hard candy generously in the window of the letter." What they don't mention is how to crush those hard candies (they do suggest using jolly ranchers specifically, which was helpful to know). 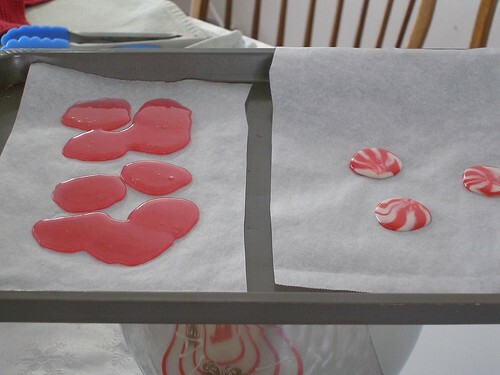 I did this to one of my old cookie sheets trying to get "crushed hard candy". I've tried putting them in the freezer to make them more brittle and was *this* close to heading to the hardware store to buy one of those tools for shattering windows. You know, the kind that you're supposed to keep in your car with you in case you drive into a lake. Anyway, I'm here to tell you that I have come up with something that works fairly easily and doesn't involve a trip to the hardware store. It would be useful on both these cookies and this gingerbread house. 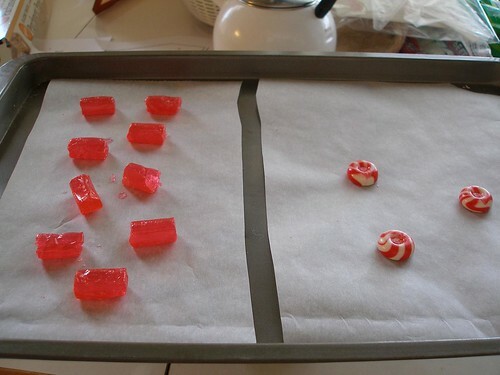 First put the candies on a parchment paper (or Silpat) lined cookie sheet. Put in a 300 degree oven until they are completely melted flat. This takes between 5 and 10 minutes. Pull them out and let them cool completely. At this point you can either crush them with the hard implement of your choice or break them into small pieces with your hands (though be careful, cause they can be sharp). Personally, I like the pieces. One of the other problems I'd originally had with the recipe was that sprinkling crushed candies resulted in lots of stray melted candy all over my cookies. These bigger pieces are much easier to place, which is good because I am messy. Now, put back into the oven to melt. The bigger pieces do take longer to melt than the crushed. So, when cooking the cookies originally, you'll want to pull the cookies out about 10 minutes before they are done and then add the candy pieces. That way they won't overcook when you put them back in to melt the candy. This process might seem to require more time than banging away at hard candies, but it really took me much less time and definitely much less effort. 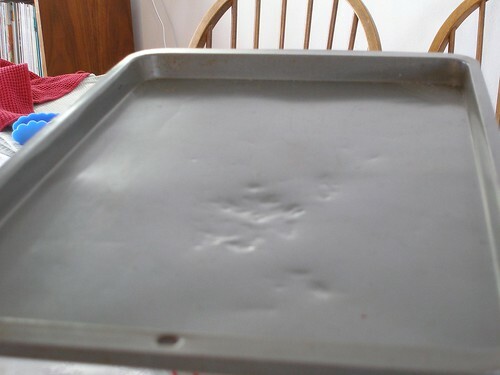 And I'm sure Jeff's glad that I didn't pound dents into his fancy air bake cookie sheets. Wendy, THANK YOU for the brilliant suggestion! I too ran into a recipe that suddenly called for crushed candies in step 3, as though it's an ingredient everyone has on hand, like sugar. After 15 fruitless minutes of trying to crush Creme Savers with a rolling pin, I was ready to stab myself. Luckily I tried the Internet instead, and this trick worked perfectly. Great, easy-to-follow directions, thank you. Plus the melted Creme Savers look like pop art! Thanks so much for the tip on how to melt jolly ranchers! I couldn't find that anywhere! Your answer to this problem was so well done, pictures and all. 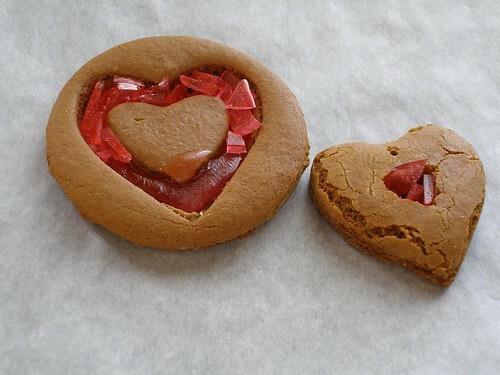 I made stained glass cookies with Life Savers and crushed them with a small electric food cutter. It worked great. But the Life Savers in the cookies were bitter. Do you have any suggestions for a better flavor? Karen, I'm so glad you like it. And great for you that the cutter worked. But I have no idea about the bitter flavor. I didn't notice that at all with the jolly ranchers and I can't think of anything in the cooking process that would make any candies become bitter tasting. 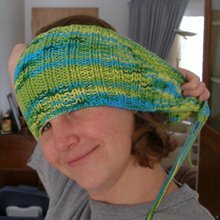 i am making a cake & cupcakes and want 'jewels' for it (without spending any more $$ than i have to). what if- you melt the candies your way, then pour them into aluminum covered molds...?? Amber, are you talking about the little plastic molds? Because I actually did try it with those. It didn't work really well, but depending on the size of the mold (if the piece of candy matches the size of each mold), you might be able to pull it off. You most likely won't be able to pour them, it doesn't get quite that hot. What I did was to put them on individual squares of parchment paper (big enough for it to spread out) and melt them til they were pretty soft, but not really flat. And then, using a spatula, lift the candy and paper and put it upside down on the mold. You'll probably only be able to move a few of them before they've cooled down enough that you have to put them back in the oven. Like I said, it isn't a great technique, but I did manage to get a few heart shaped candies before I gave up and moved on to other projects. If they sold silicone molds, that would be ideal; you could just put the whole candies right in there and pop them in the oven. Good luck. I'd love to see how they come out! Amber, just wanted to clarify, "You'll probably only be able to move a few of them before they've cooled down enough that you have to put them back in the oven"... what I mean is before you put the ones still on the sheet back in the oven, not the ones in the mold. Hopefully, the ones in the mold will have squished down nicely into it thanks to gravity. It might take some practice to get the melted consistency just right so they aren't too runny, but still will fill the mold. Thank you so much! I've been wanting to make stained glass window cookies for a while now, and all I've succeeded in doing is denting my rolling pin, ripping through countless ziploc bags and scaring the bejeezus out of my 3-year-old from the pounding. Definitely smarter, not harder. You rock! Hi There! Thanks so much for posting this tip. I tried it and also got some bitter-tasting life-savers (I think it's those flavor oils that aren't meant to be heated), and I was trying to make some really small 'stained glass' and wanted to be able to get it much finer. Then it occured to me: Pill Crusher! I have one of these things in the cupboard to crush tablets for my critters and sure enough, it crushes a small candy so easily and in about 6 seconds. Me again. I should have mentioned that it's one of those screw-down type pill crushers: Pop in a candy, put the lid on and twist that lid until the candy crunches inside, shake it a little and twist the lid some more. Then pour it out into a bowl and get another candy. It doesn't make much noise, it doesn't require strength, and it's fast. Just thought I'd pass it along. Thank you so much for posting this. 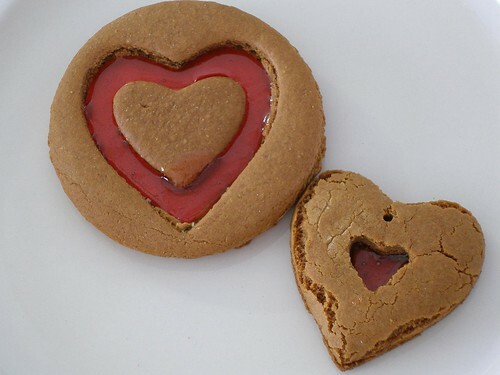 I am attempting the Martha Stewart stained glass cookies, and this was really helpful. The jolly ranchers melted beautifully. Thanks! By the way, Party City sells jolly ranchers in bins where you can pick out the colors that you want. That helped me get enough blue raspberry for a couple tardis cookies. Ahhh how I love timeless tips...thank you so much! I've been looking for a way to crush several bags of peppermint candy for holiday baking and candy making. This worked perfectly! Brilliant tip , worked out well. Thanks for sharing! !